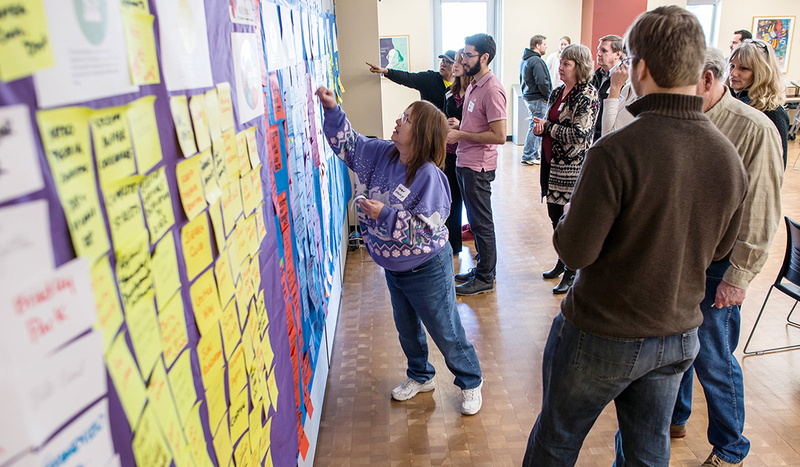 Peoria residents share their community values as part of a workshop session. Forty people gathered in a conference room at the Peoria Riverfront Museum on a snowy January day. Artists, activists, public officials, union representatives, academics, and retirees were there to participate in the first of several planning workshops. They were taking a hard look at the city they call home, and imagining the city they would like it to become. Corso was charged with addressing one of the most pressing issues Peoria has: combined sewer overflow. 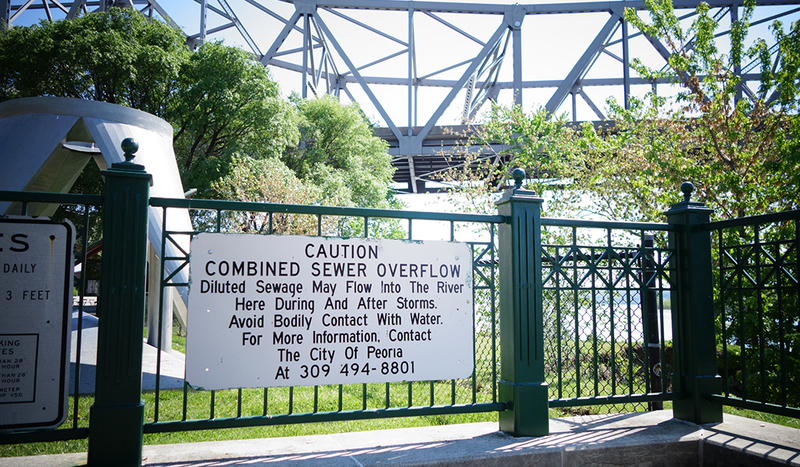 When a wet-weather condition arises and rain and melting snow overwhelm the system, this can result in raw sewage dumping into the Illinois River. The problem, which for years has plagued the city, is being closely watched by the United States and Illinois Environmental Protection Agencies. The message the agencies gave the city was clear: Develop a plan to fix it. Kara Salazar, IISG sustainable communities Extension specialist, introduces Tipping Points to Peoria. 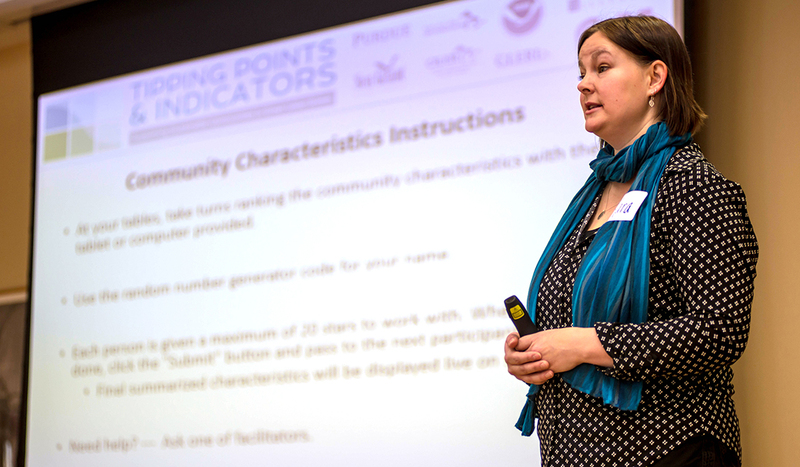 Kara Salazar, sustainable communities Extension specialist with IISG, led that visioning session workshop using a complex, web-based planning tool, Tipping Points and Indicators. The tool is a collaboration of 22 scientists and nine institutions. 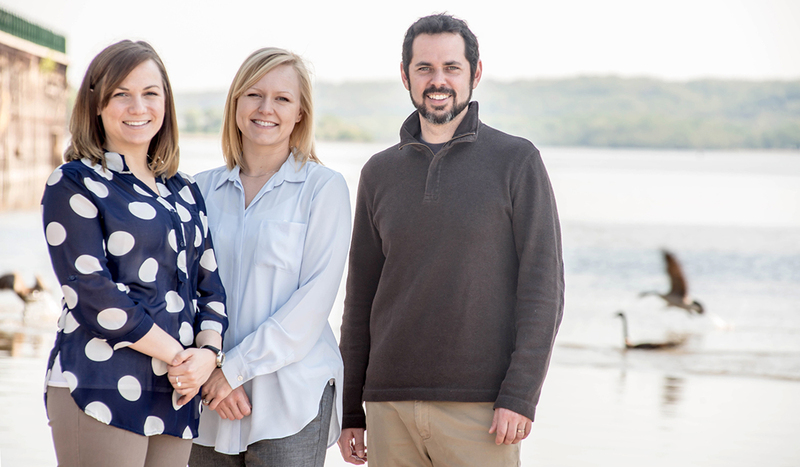 It compiles research from around the Great Lakes that identifies impacts on water quality from multiple land uses—agriculture and urban—in various locations, particularly near lakes and streams. Tipping Points uses data to help communities and planners understand how close their watershed is to ecological thresholds and what the watershed will look like if land-use decisions continue on the same course. Cross a tipping point, and you risk not being able to rehabilitate an impacted region. Before this Peoria project, Tipping Points had not been used on such a heavily urbanized location. Purdue PhD student Jingqiu Chen studied the impacts urbanization has on water quality and developed an additional modeling tool specifically based on Peoria’s stormwater issues. The tool’s ultimate goal is to help communities determine the best way possible—ecologically and economically—to maintain and restore healthy water conditions. “Peoria has an issue they’re trying to resolve and there are very costly solutions to it, but we’re helping them explore alternatives that are less costly and would provide other environmental benefits as well,” said Dr. Bernie Engle, Purdue department head of Agricultural and Biological Engineering leading the project with Jingqiu Chen. One way to do that is green infrastructure, which can include parks and open spaces, or installing more porous surfaces. Each of those choices will have positive and negative effects on the community and the goal is to pick the suite that match community values. The city’s goal is to resolve its problem with 100 percent green infrastructure. If the plan is successful, Peoria would be the first in the nation. Tipping Points is helping Peoria figure out not only what environmental variables need attention, but how to go about choosing among the many green infrastructure options. The program is so targeted, it can, for instance, even help a community like Peoria set aside land for agritourism or rehabilitate wildlife populations. Peoria will be getting lots of help along the way. University of Illinois Extension and Illinois Water Resources Center will offer guidance to the city to do its part in addressing the state’s ongoing nutrient loss reduction strategy as well as provide education opportunities.